Prayer is the way of knowing God the Father, Jesus, the Son and the Holy Spirit. The value we place on prayer amounts to a choice between wisdom or folly. It’s that simple. Prayer is a necessary, holy duty. Prayer is wise because it is the will of God. Prayer is worth the effort and brings fruitfulness. Prayer empowers the active apostolate and forms “contemplatives in action”. 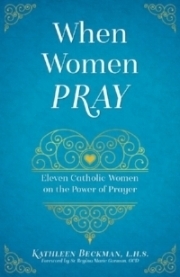 But for prayer we need courage (Catechism clearly states that prayer is a battle) and we need encouragement from others who practice the way of prayer. Our Lord does not need special people or extraordinary circumstances. Look at the people He chose: a Hebrew girl, a carpenter, a few fishermen, Magdalene, a group of women who accompanied Him. Holiness is integrated within the routine and commonplace, within the scheduled and unscheduled happenings during each day’s unfolding. In that unfolding, our individual paths are often fraught with suffering and pain, that is true, but they are also emblazoned with the re of love that overcomes and prevails.